The AVN-CU4-DANTE is a portable commentator unit. Using Dante® AoIP together with 4 wire connections the AVN-CU4-DANTE bridges the gap between old and new technology, allowing the ease of connectivity & functionality of AoIP, together with the legacy connections needed to operate with the existing infrastructure in some stadia and sports grounds. This new Dante® commentary unit has been beautifully designed and is the same size as the existing Sonifex CM-CU1 single 4-wire unit whilst packing in more features. It’s been designed from the ground up to be configurable for different situations with config files that can be saved and recalled for quick setup. Additionally, buttons and rotary encoders can be locked out from use, if the unit is being operated by less-technical commentators. The AVN-CU4-DANTE is a dual version of the AVN-CU2-DANTE providing four mic/line inputs with a wide, adjustable gain range and four stereo headphone outputs with lockable jack sockets, suitable for operation by three or four commentators. 4 x On-air buttons (CU2 has 2). 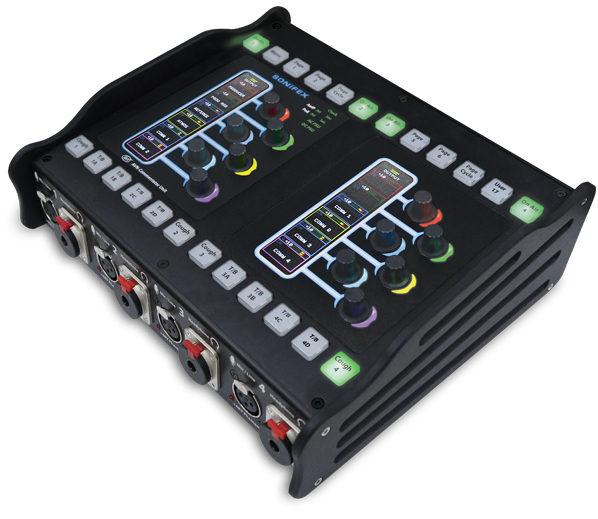 The front panel houses 4 x locking mic/line inputs with +48V phantom power indication and 4 x headphone outputs on locking 6.35mm jack sockets. There is an AC mains input on an IEC inlet, with a universal supply. The unit supports up to 16 input and output AoIP channels and up to 16 simultaneous input and output AoIP streams. Stream setup to and from the unit is initially via Dante® Controller with more detailed configuration performed using the built-in web GUI. 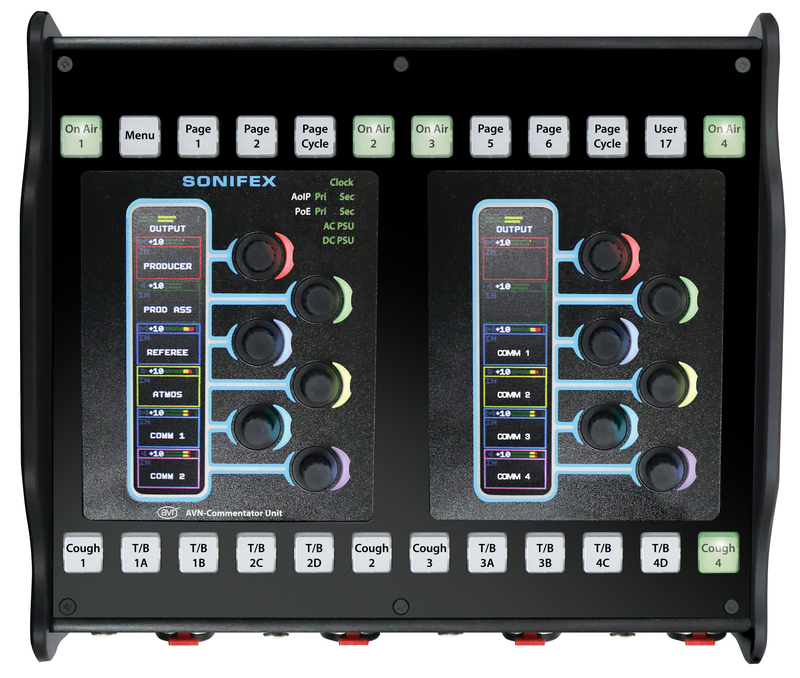 The power of this unit lies in the impressive mix engine which overlays the usual Dante® Controller settings. Once Dante® flows have been made, the mix engine allows inputs and outputs to be mixed freely to AoIP or physical inputs and outputs, controlled using the programmable buttons and rotary encoders on the unit. Remote operation* of the unit is available using the Web-GUI allowing independent control of it from any network connected area. The AVN-CU4-DANTE provides four locking mic/line inputs, each with +48V phantom power indication and a wide, adjustable gain range. It has four stereo headphone outputs with locking 6.35mm jack sockets, suitable for operation by four commentators. It’s powered using Power over Ethernet (PoE), using Neutrik EtherCON connectors, with primary and secondary ports for power and data redundancy. There’s an additional 4 pin XLR 12V DC input and an AC mains input on an IEC inlet, with a universal supply. The 12 x push-button rotary encoders and 24 x key-cap buttons are fully configurable, to control input & output levels and panning. Each rotary encoder has a separate colour-coded meter section showing the channel name, detailed level metering, left/right panning and a limiter indication, on a bright daylight reading display. Colours can be programmed per encoder to quickly identify particular source groups, so headphone source selection becomes intuitive. Metering is available per input/output, with output metering configurable as pre or post level adjustment. The top of the display shows output metering, a limiter indication and the name of the output. A limiter is available on every output. The I/O can be assigned as programme inputs, talkback inputs, mic outputs (line level), PA outputs, zone outputs or talkback outputs, as desired. In addition, the AES/analogue connections can be used as an insert or exit point into/out from the AoIP network. The unit has dual redundant network ports on both RJ45 (PoE using 2 x Neutrik EtherCON® connectors) and SFP cages. There are 10 x configurable GPIO on a 15 way D-type connector with 1 x switched changeover output. 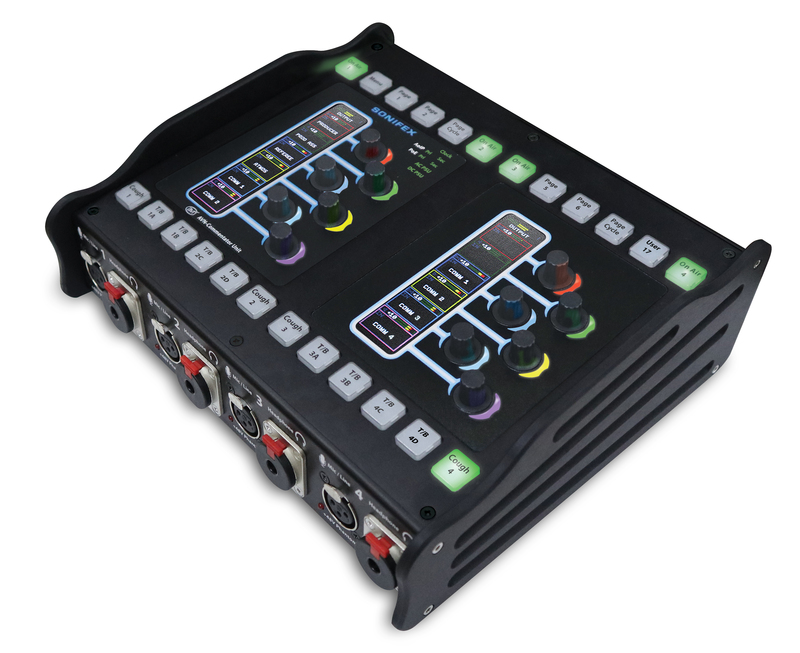 4 x On-Air buttons can be used to connect mic audio to the main output, either over AoIP or via the AES digital audio connection. The On-Air buttons can be locked if required. A Menu button can be used to access limited setup options on the TFT display. Page buttons change the display and encoders to monitor an additional set of sources, mix points or outputs. Up to 8 pages can be pre-programmed, e.g. one for talkback inputs, one for outputs, one to monitor other sources. 4 x Cough buttons take the commentator off-air while pressed. 3 x User button can be programmed to perform any function using the web server. 8 x T/B (talkback) buttons can be configured to initiate talkback over AoIP or AES digital audio connection, using 8 x talkback buses. The talkback buttons operate with lazy talkback, taking the commentator off-air when invoked. The illuminated ‘Sonifex’ logo acts as a power indication and there are illuminated LEDs to indicate network clock status, AoIP Primary and AoIP Secondary link status, PoE Primary, PoE Secondary and DC power active. (* Remote control facilities scheduled in V2 firmware).